Think of adventure bikes and your mind will most likely go straight to bikes like the BMW R1200GS or KTM 1290 Adventure. Both excellent bikes, but they're expensive and not accessible to everybody. Sinnis have fixed that with their new-for-2017 Terrain 125, which costs just £2400 and can be ridden on L-plates. The Terrain 125 is powered by a single-cylinder air-cooled engine producing 11bhp. The 11bhp power figure isn't much, but it puts it on a par with the rest of the 125cc class and will no doubt be soft enough for easy use on rough ground. If you drop it on the rough stuff the relatively low weight of 150kg means it won't be too difficult to get it upright again. The 800mm seat height means smaller riders are also catered for. However, the 17 inch cast wheels may hold the Sinnis back off-road, limiting tyre choice to rubber that's oriented more for road use. Electronic fuel injection ensures the new bike meets Euro 4 regulations and also improves economy, with the Terrain able to hold up to 14 litres of fuel. Sinnis say the new Terrain was tested extensively on the hills, greenlanes and mountains of Wales. 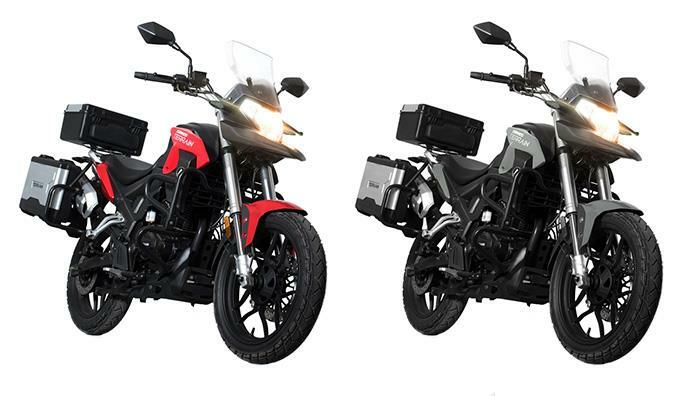 Sinnis Motorcycles have been operating in the UK since 2006, and sell bikes built by Chinese manufacturer Jinan Qingqi. One of the largest motorcycle manufacturers in China, Jinan Qingqi also produce parts for Suzuki and Peugeot.